Attempts to raise money for World War I resulted in replicas of tanks being quickly knocked together to serve as rallying points and the finished article, weird and wonderful according to time, talent, enthusiasm and materials available. The headmaster of the Testimonial Schools, William Swire, War Savings Secretary, decided to build an exact replica of an army tank and made a good job of it. Nicknamed ‘Egbert’, it was assembled round a lorry chassis with an engine. Egbert was used up and down Lancashire in towns and villages too small or idle to build their own models. Standing on the gun turret, speakers exhorted the locals to lend their money for the war effort and that was how Egbert did his bit. John Crookall is on the far left of the postcard. Tank Week in 1916 realised over £250,000. 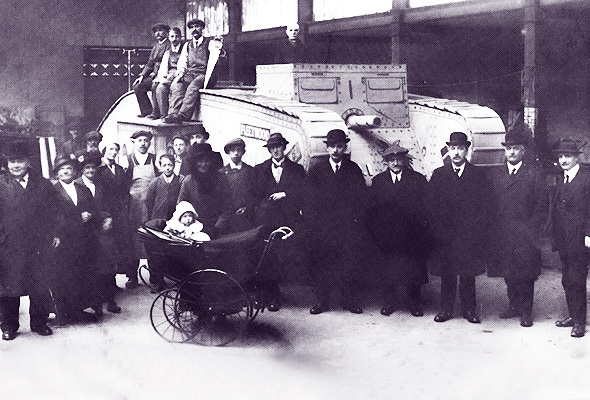 “Fleetwood tank received a cheque from Prudential for £10,000″ was billed over the premises in Lower Queen’s Terrace, chosen as headquarters for the campaign.